Nanny and Papa are leading characters in the back story of fresh juniper. They were role models for darling hubby Doyle and me. In fact, Nanny and Papa were the perfect set of grandparents. In order to understand fresh juniper better, it is necessary to provide some historical tidbits that add flavor and texture to story. Nanny and Papa were very devoted to their family. 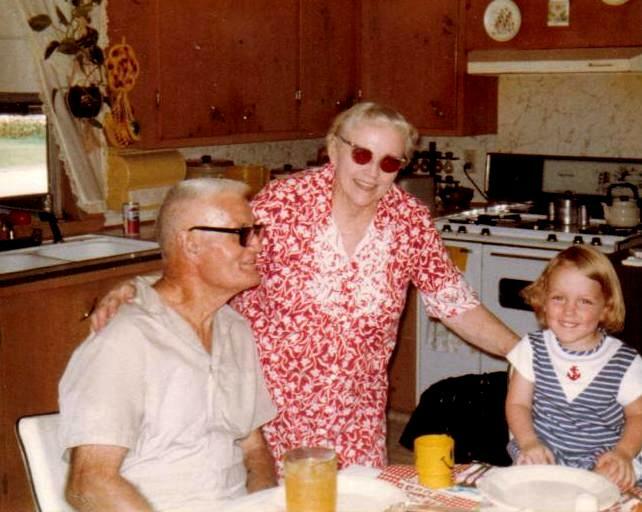 Nan wasn't able to give birth to a baby, so she and Pop chose to have their daughter Jo Ann through adoption. They brought her home from the orphanage during the Great Depression. 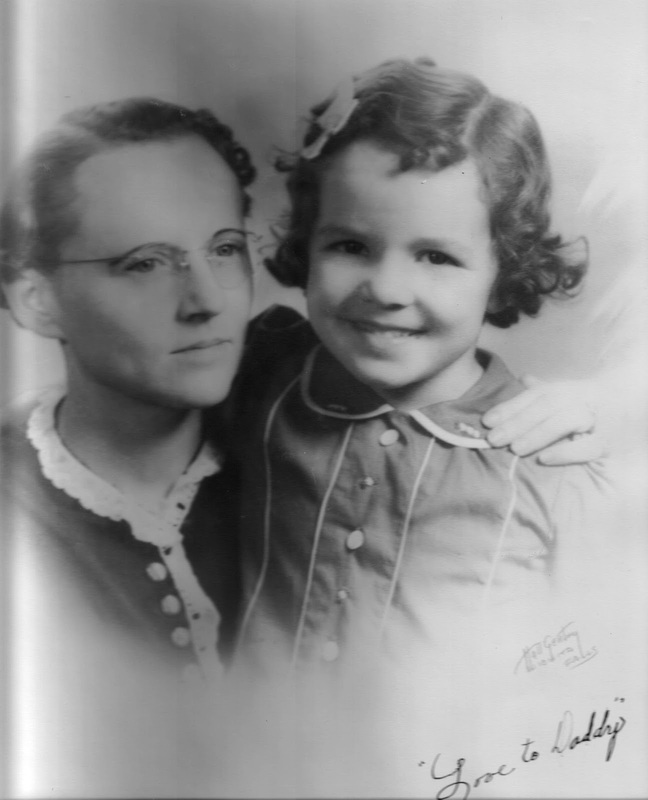 Jo Ann was their only child and the apple of their eye. 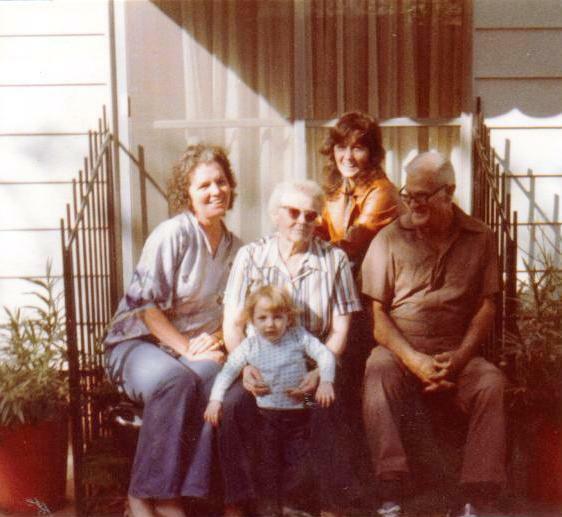 L - R: Jo Ann (Mom), PRINCESS Ann (my firstborn), Orbie Ann (Nan), Reecea Ann (me) and Pop (Homer). Time passed. Jo Ann grew up. Nan and Pop became grandparents and great-grandparents. They were proud of their family, accomplishments, and the life they had built together. Why not? They had struggled and survived through so many hardships - both on a national scale and those that were more intensely personal. Don't you just love the little patio they added on to the east side of their house? It is so retro. Nowadays people add decks, not patios. Their patio installation included the standard paved groundwork, a sliding glass patio door, wooden stairs on a wrought iron base descending from the sliding doors to the pavement, wrought iron stair rails, and potted plants. The whole family had to be in on this photo circa 1981. 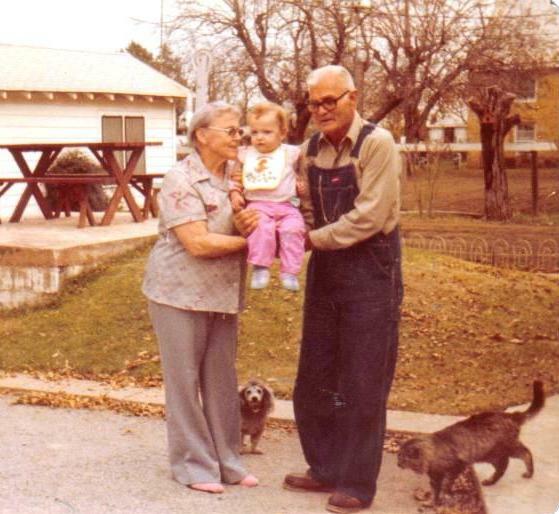 Nan, Pop, PRINCESS, Poody the poodle and the kitty cat. Ahh, the memories this little photo contains are so clear. The sidewalk they poured, the driveway covered with chat that Nan kept neatly raked, the decorative little wire fence bordering the vegetable garden, and the cozy one bedroom cottage they rented out all seem close enough to touch. For a moment, looking at this makes it all seem so fresh. Alas, those days are come and gone. The tan two-story building in the background is their church, the First Baptist Church of Temple, OK. If the resolution on the old 110 Pocket Camera photo was clearer, you could probably even see the silhouette of the old grain elevator in the background behind Nan's head. It was the tallest building in town. PRINCESS loved following Pop when he was outside working in the yard. The building on the the left is a one car garage, which Nan occasionally referred to as "The Barn". On the right side of the barn is the chicken pen they added. The chicken pen was always a favorite of the kids. Everyone's favorite chicken was a little hen they named Minnie Pearl. They had other chickens, but Minnie Pearl just seemed to stand out. The tree on the right in front of the chicken pen is their cherished Persimmon tree. Nan was a homemaking expert and loved to cook The proof of this was evident whenever you walked into her home and detected those delicious aromas emanating from her kitchen. Whenever family came for a visit, she insisted on preparing the meal for everyone. It really didn't matter if you were hungry or not. She was quite polite about it and would ask, "Are you hungry? Do you want something to eat?" However, she was completely unconcerned about whether your response to her question was negative or affirmative. At that point, you might as well sit down at the table. A plate of something was coming your way. In one way Nan was a little bit like the Borg. Resistance was futile. The roots of fresh juniper sprang from the junipers Nan and Pop planted and nurtured in their yard. 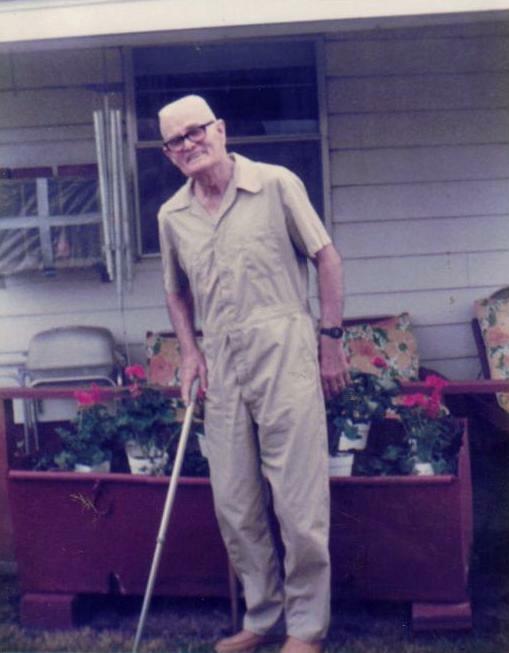 Yard work and gardening was a big part of their lives. Their landscaping displayed a veritable garden-like wonderland in sleepy little Temple, OK. 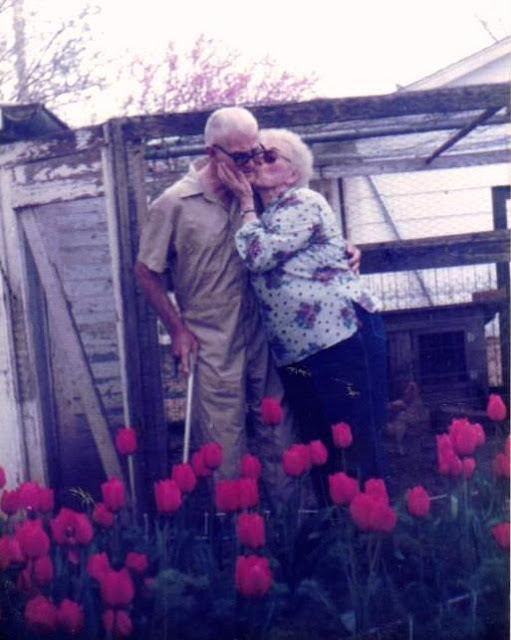 Pop really loved tulips, especially the red ones. They planted a bed of tulips right in front of the chicken pen between the garage and the persimmon tree. Every year when Pops birthday would roll around, those tulips were full of gorgeous red blossoms. Pop poses for another birthday photo by the flower box. In addition to the blooming tulips, Pop's birthday brought about another annual event. It was time to plant the Geraniums in their designated spot. See that painted iron flower box holding the pots of geraniums? 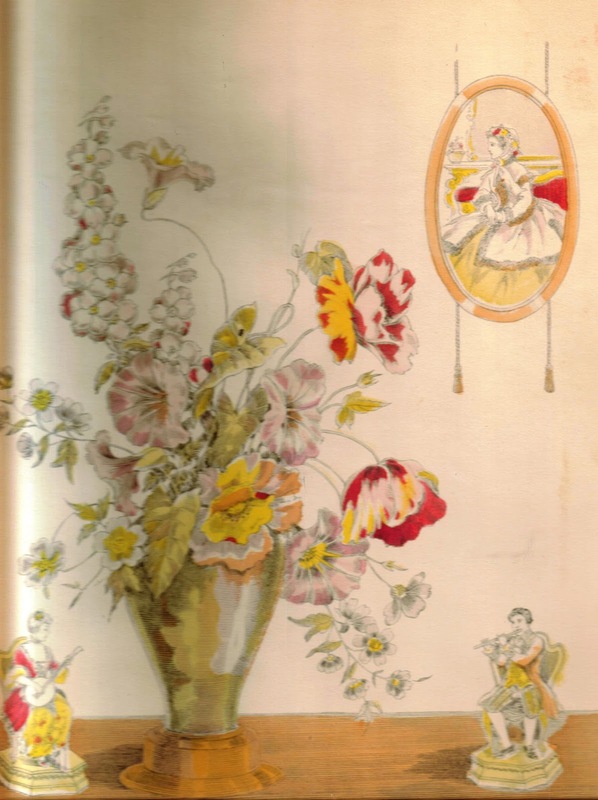 It has a long history with Nanny's family. Nan had inherited it from her parents, Isaac Luther (Pa Luke) and Fanny Elvira (Granny Puss). It was an old iron trough they used to butcher the hogs on the farm. Nan and Pop rarely wasted anything. Waste not, want not, right? Pop took that old hog trough and converted it into something beautiful to enhance the landscape. I think it is a great example of upcycling. Hope you enjoyed the back story here. 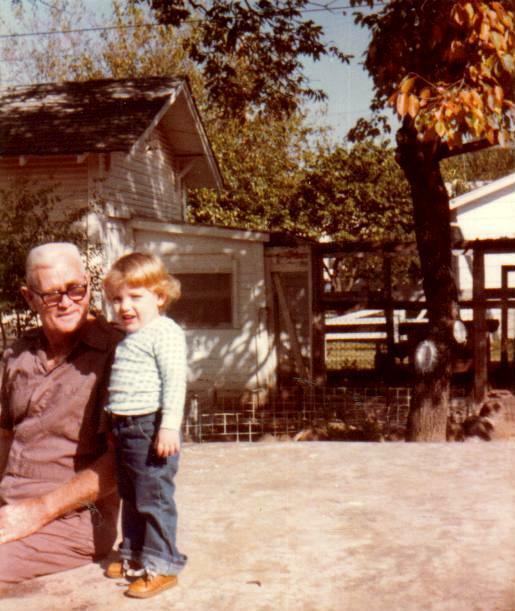 Today as I prepared this post, I discovered more hidden treasure from Nan and Pop. These two pictures were pressed between the "Love to Daddy" photo (at the top of this post) and the cardboard backing of the picture frame. Found them whilst taking the photo out to be scanned. 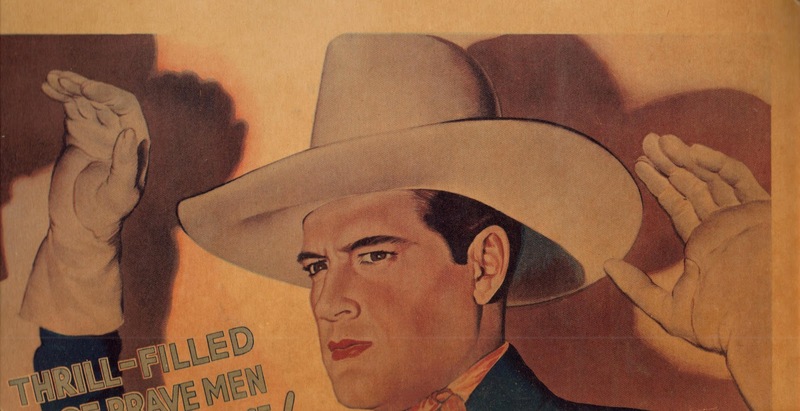 Doyle said the cowboy might be Tyrone Powers depicted in an old western movie poster. I am filled with curiosity. Do you have any info? Please share! Had to show you the front and back of the last one - I think it comes from Radio Picture Frame Co., Inc., 1540 Covert St., Brooklyn, N.Y. Please share info if you have anything on the picture or stamp. Your comments are welcome. I love these pictures and the stories. Thanks for sharing. Thanks for reading, and for your sweet comments.